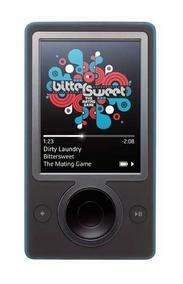 Microsoft's Zune's Social Networking Abilities | OhGizmo! We recently discovered that a fair amount of you use us as a primary source for gadget news. Who’d-a thunk? So, we’d be really sad if you didn’t end up finding out about Microsoft’s Zune. It’s the company’s attempt at emasculating the pretty boy iPod, and to be quite honest, there’s actually a chance in hell (a little one) that they manage. You can browse around for specs, but the basics are a 30GB drive, QVGA screen, FM tuner and WiFi. Pictures, music (duh) and video. Of course, there’s more, like the Zune marketplace (similar to iTunes music store), but we feel that the player’s real advantage is in Zune-to-Zune sharing. Just by coming into range of one of your friend’s Zunes, you’ll be able to wirelessly share any song with them. They can listen to the track three times, or keep it for three days, whichever comes first. If they like it, they can flag it for later purchase; kind of like a try-before-you-buy deal. It’s smart business, but there’s more to it than selling songs. Just like that, Microsoft may have created a revolution. Why? The MySpace generation loooves putting themselves out there, and telling the world just what they like. So, it’s not inconceivable for hordes of Zune totin’ emos kids from going around, broadcasting their playlists for all to hear, and turning the device into more than just a music player… something that MS is hoping for. This could work, after all. Don’t you think? I mean, let’s face it…you get three plays or three days and then the file goes away. That’s just lame. And they cram their own DRM into any file you share this way, which means that even if you own a CD and you want to share it with your significant other it gets treated the same as a file you downloaded from their music service.